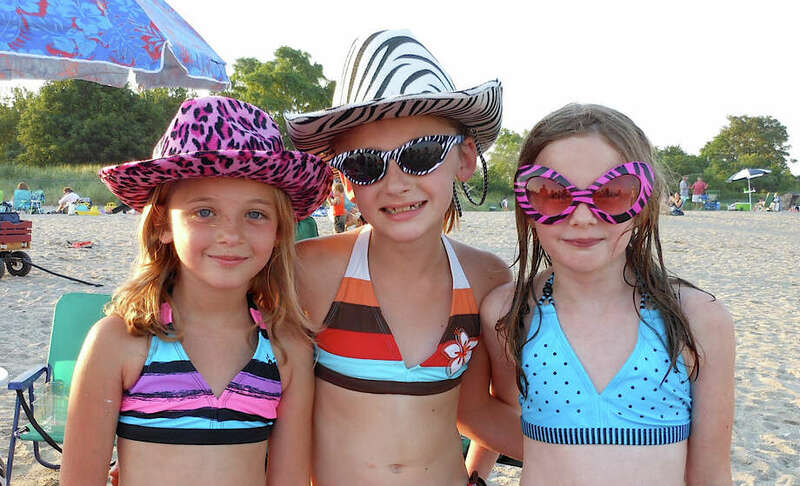 July birthday girls Mya Krasowski, Kiley Kellerman and Alison Jaeger of Fairfield at the Sand Jam on Jennings Beach Friday. The crowed was jammed -- and jammin' -- Friday evening on the beachfront in front of the Jennings Beach pavilion. The hot summertime fun, appropriately, was the Parks and Recreation Department's first Sand Jam of the season, featuring music and movies for dozens of families. As many relaxed over picnic dinners, deejay Marvin Parsons spun pop music before dusk settled in and an outdoor screening of "Kung Fu Panda 2" rolled. The program also featured a "Spin to Win" contest for Frisbees and inflatable beach balls, which then bounced around the crowd for more frolicsome fun. Parsons added the to festivities with a trivia contest testing the crowd's knowledge of television show theme songs. The next Sand Jam is set for 6:30 p.m. Friday, July 13, at Jennings Beach, featuring deejay music and the movie, "Happy Feet 2."